I was soo tired when I went to bed last night that I think was at the point of overly tired – and overly tired always ironically means trouble sleeping. Gr! I thrashed around until a bit after 1am and decided it was time to get up and try reading. I cracked open Animal, Vegetable, Miracle and actually got pretty into it. Once my eyes started feeling tired, I turned the light out again and fortunately fell asleep. The 6:20am alarm though was quite, shall we say, alarming though after only 4 or 5 hours of sleep. I made an exectutive decision and changed the alarm to 8am, deciding I’d go into my internship late. I know I would be compltely unproductive if I went into work feeling completely exhausted and delirious. At 8 I got up and emailed my boss saying I’d be late and slowly got ready for work. 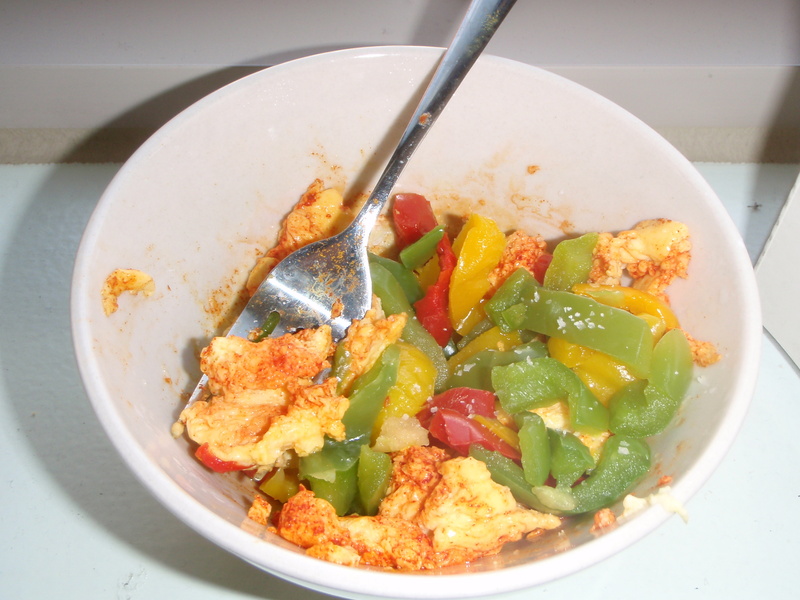 Some eggs to start the day, peppers, and turmeric. Coffee with cinnamon. I sleepily then headed to the metro. Time for work! Hopefully with the extra hour of sleep I can get some things done here today. Catch you later.